Was this the most offensive set of cigarette cards ever issued? In 1890 the American manufacturer W.S. Kimball issued a very nice set of cards that depicted the heads of state of various small nations and tribes around the world. This was a very nicely produced set and everything would have been fine except for the name they decided to give to the set - 'Savage and Semi-barbarous Chiefs and Rulers'. Naturally the rulers and chiefs concerned were not overly pleased about being described in this way and the set also caused offense in Britain as some of the heads of state depicted ruled nations that were part of the British Empire. Today, despite its 'un-PC' nature the set is highly sought after and is an attractive and interesting snapshot of its times. 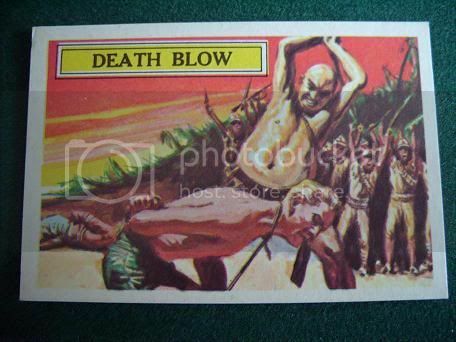 Re: Was this the most offensive set of cigarette cards ever issued? I suppose it depends on what you find offensive really. 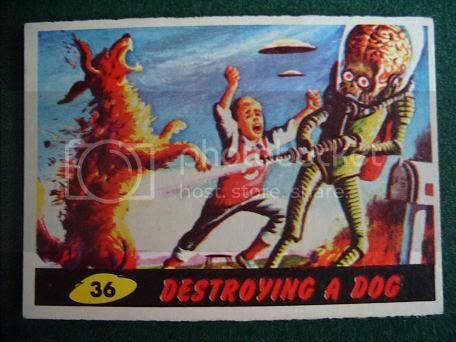 I remember back in the 60s some bubble gum cards caused outrage. For example there was Dr. No. Worried parents were convinced that Ursula Andress exposing her thingies would pervert children irretrievably. Then there was Battle which showed far too much gratuitous violence (personally I thought Civil War News had the edge). In Germany there were calls to ban the Garbage Pail Kids. There are also sets which were specifically intended to offend such as "Raubstaat England" issued in 1941. Then there were Raemaker's War Cartoons which supposedly offended the Kaiser so much that he put a price on Raemaker's head. Battle,Civil War News and Mars Attacks. As 10 year olds my school friends and I thought the were great,and I still do. I agree with Ian.Civil War News has the edge and still finds willing buyers on Ebay. Sorry only one photo uploaded and too large.I'm new at this will try again.